A FOOTBALL club which says it is under threat because of an ongoing planning dispute over the use of its floodlights has put together a petition to gather support. Lutterworth Athletic, which is based at the Dunley Way Football Ground in Lutterworth, installed floodlights at its ground last year. However, although the club was allowed to install the lights, it has not got permission to switch them on because of a planning wrangle over the amount of ‘light spillage’ caused. The club has recently submitted a new planning application which it hopes will provide enough information so it can switch the lights on for the three hours a week they would be required. Mr Weston said that without floodlights, the club does not qualify for a £20,000 grant from the Football Foundation, money which he says is essential for the club’s survival. 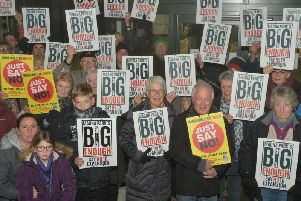 Club members have now taken to the streets of Lutterworth in a bid to get support from residents, in the form of a petition, to show Harborough District Council how much support the club has. Mr Weston added: “The club currently has over 250 children along with three senior sides all playing at the top level in Leicestershire. The application is due to be considered at a forthcoming Harborough District Council planning meeting.